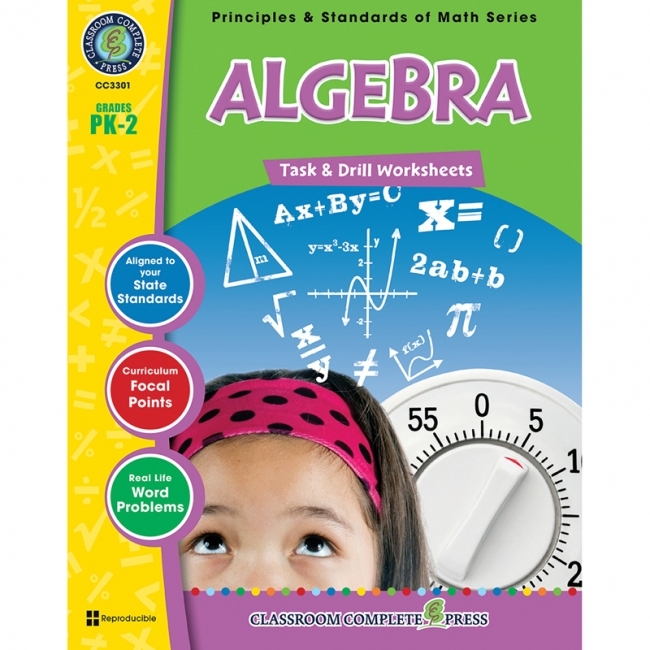 Get hands-on with early level Algebra by breaking the concepts down for beginner learners. Our resource introduces the mathematical concepts taken from real-life experiences, and provides warm-up and timed practice questions to strengthen procedural proficiency skills. Make number sentences true by writing in the missing number. Sort numbers in order from biggest to smallest. Use a calculator when learning about order of operations. Finish the patterns with the missing images. Fill-in the missing numbers in a hundreds chart. Choose more than, less than, or equal to. Find the missing fact from the fact family. Put books into equal groups. The task and drill sheets provide a leveled approach to learning, starting with prekindergarten and increasing in difficulty to grade 2. Aligned to your State Standards and meeting the concepts addressed by the NCTM standards, reproducible task sheets, drill sheets, review and answer key are included. Extend your knowledge of numbers by examining how fractions, decimals and percentages work. Our resource introduces the mathematical concepts taken from real-life experiences, and provides warm-up and timed practice questions to strengthen procedural proficiency skills. Cut a cake into equal parts to share with friends. Play with percentages by finding out how many people 20% of the total represents. Put fractions in order from smallest to biggest. Find the place value of the underlined digit. Translate base-ten models to numbers. Round decimals to whole numbers. Find the equivalent fraction. The task and drill sheets provide a leveled approach to learning, starting with grade 3 and increasing in difficulty to grade 5. Aligned to your State Standards and meeting the concepts addressed by the NCTM standards, reproducible task sheets, drill sheets, review and answer key are included. 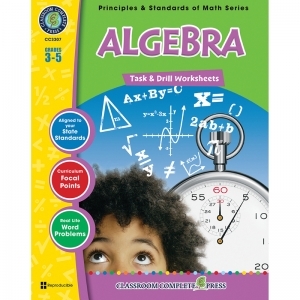 Go further with your study of Algebra concepts by looking at expressions and equations. Our resource introduces the mathematical concepts taken from real-life experiences, and provides warm-up and timed practice questions to strengthen procedural proficiency skills. Calculate the cost of a year's membership using an equation. Solve for "x" in an equation. Graph a solution on a number line. Evaluate expressions by substituting the value for a number. Rewrite expressions using the commutative, associative or distributive property. Write verbal expressions as algebraic expressions. Simplify expressions by combining like values. The task and drill sheets provide a leveled approach to learning, starting with grade 3 and increasing in difficulty to grade 5. Aligned to your State Standards and meeting the concepts addressed by the NCTM standards, reproducible task sheets, drill sheets, review and answer key are included. Increase your bank of known shapes by exploring and identifying two- and three-dimensional objects. Our resource introduces the mathematical concepts taken from real-life experiences, and provides warm-up and timed practice questions to strengthen procedural proficiency skills. Identify polygons from other shapes. Explore equilateral, isosceles and scalene triangles. See how many different quadrilaterals there are. Match shapes with their names. Identify shapes that are parallelograms or polygons. Identify between regular, irregular, right, and oblique pyramids. Use different combinations of pattern blocks to create hexagons. The task and drill sheets provide a leveled approach to learning, starting with grade 3 and increasing in difficulty to grade 5. 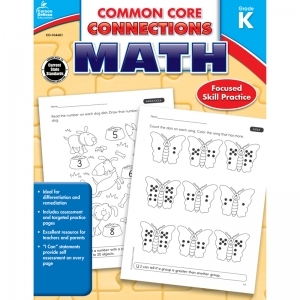 Aligned to your State Standards and meeting the concepts addressed by the NCTM standards, reproducible task sheets, drill sheets, review and answer key are included. Start measuring lengths and weights while mastering conversions. 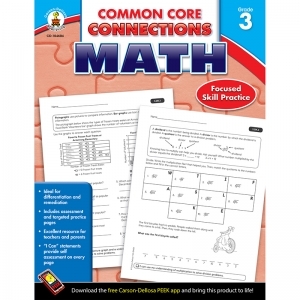 Our resource introduces the mathematical concepts taken from real-life experiences, and provides warm-up and timed practice questions to strengthen procedural proficiency skills. Measure the length of objects using your hand as a unit of measure. Convert weights from pounds to ounces and kilograms. Find the volume of differently sized boxes. Accurately tell the temperature with the help of a thermometer. Convert length measurements. Match measurements with their clues. Find the best measurement for different objects. Show the time on an analog clock. The task and drill sheets provide a leveled approach to learning, starting with grade 3 and increasing in difficulty to grade 5. 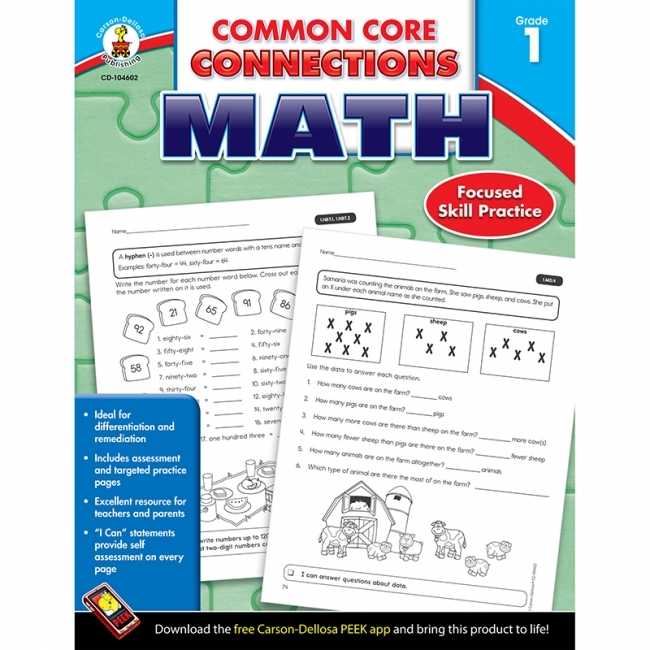 Aligned to your State Standards and meeting the concepts addressed by the NCTM standards, reproducible task sheets, drill sheets, review and answer key are included. Build a foundation and focus on what matters most for math readiness with Math 4 Today: The Common Core Edition for first grade. This 96-page comprehensive supplement contains standards-aligned reproducible activities designed to focus on critical math skills and concepts that meet the Common Core State Standards. Each page includes 16 problems to be completed during a four-day period. The exercises are arranged in a continuous spiral so that concepts are repeated weekly. An assessment for the fifth day is provided for evaluating students' understanding of the math concepts practiced throughout the week. 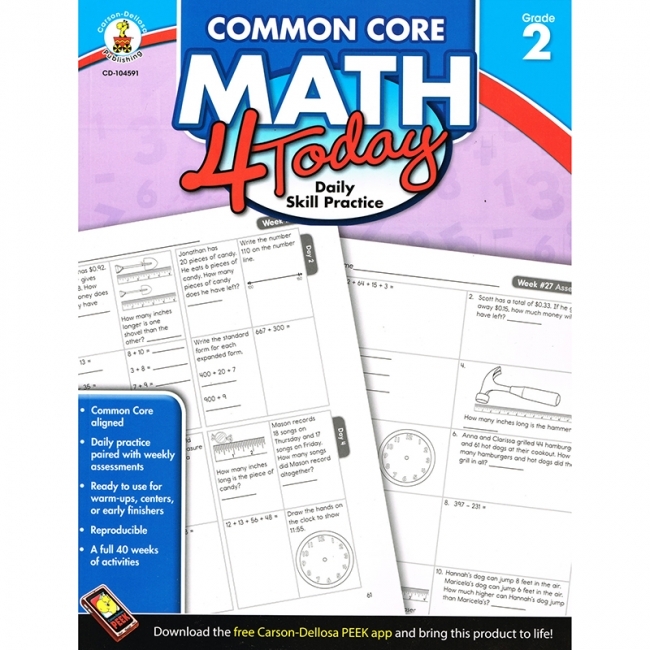 Also included are a Common Core State Standards alignment matrix and an answer key. 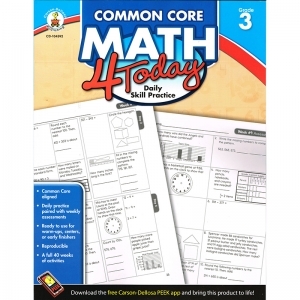 Build a foundation and focus on what matters most for math readiness with Math 4 Today: The Common Core Edition for second grade. 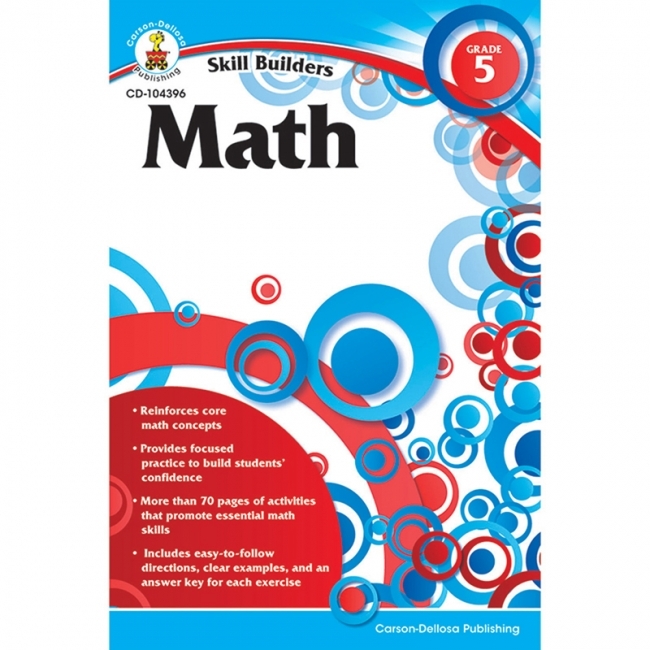 This 96-page comprehensive supplement contains standards-aligned reproducible activities designed to focus on critical math skills and concepts that meet the Common Core State Standards. Each page includes 16 problems to be completed during a four-day period. The exercises are arranged in a continuous spiral so that concepts are repeated weekly. An assessment for the fifth day is provided for evaluating students' understanding of the math concepts practiced throughout the week. 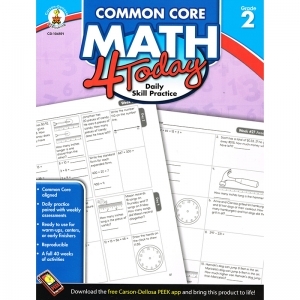 Also included are a Common Core State Standards alignment matrix and an answer key. 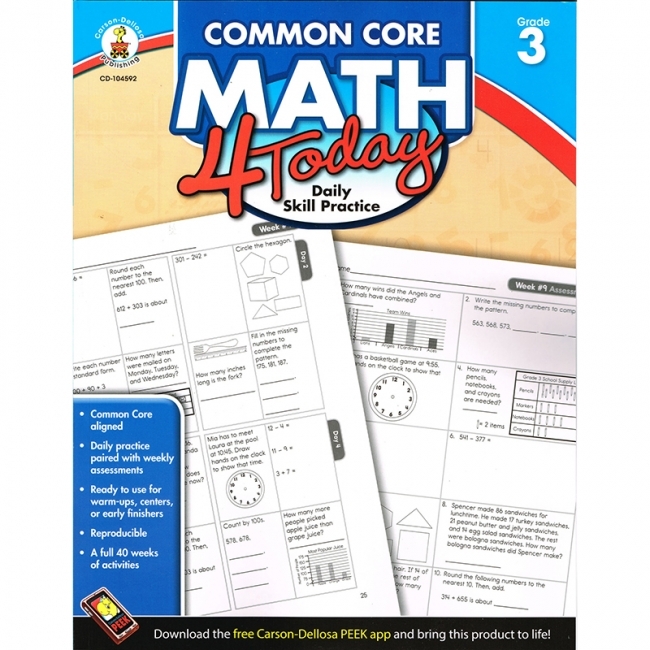 Build a foundation and focus on what matters most for math readiness with Math 4 Today: The Common Core Edition for third grade. 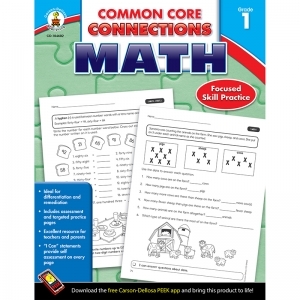 This 96-page comprehensive supplement contains standards-aligned reproducible activities designed to focus on critical math skills and concepts that meet the Common Core State Standards. Each page includes 16 problems to be completed during a four-day period. The exercises are arranged in a continuous spiral so that concepts are repeated weekly. An assessment for the fifth day is provided for evaluating students' understanding of the math concepts practiced throughout the week. Also included are a Common Core State Standards alignment matrix and an answer key. Build a foundation and focus on what matters most for math readiness with Math 4 Today: The Common Core Edition for fourth grade. This 96-page comprehensive supplement contains standards-aligned reproducible activities designed to focus on critical math skills and concepts that meet the Common Core State Standards. Each page includes 16 problems to be completed during a four-day period. The exercises are arranged in a continuous spiral so that concepts are repeated weekly. An assessment for the fifth day is provided for evaluating students' understanding of the math concepts practiced throughout the week. Also included are a Common Core State Standards alignment matrix and an answer key. Build a foundation and focus on what matters most for math readiness with Math 4 Today: The Common Core Edition for fifth grade. This 96-page comprehensive supplement contains standards-aligned reproducible activities designed to focus on critical math skills and concepts that meet the Common Core State Standards. Each page includes 16 problems to be completed during a four-day period. The exercises are arranged in a continuous spiral so that concepts are repeated weekly. An assessment for the fifth day is provided for evaluating students' understanding of the math concepts practiced throughout the week. Also included are a Common Core State Standards alignment matrix and an answer key.